TORONTO, April 2, 2019 – Welcome to the 13th and final edition of the weekly Woodbine Snowbirds Report, now in its eighth year, chronicling the winter adventures of Woodbine-based trainers and jockeys currently plying their trade south of the border. This week, we check in with trainer Josie Carroll, who has spent her winter at Palm Meadows Training Center in Boynton Beach, Florida, with a string of 12 horses. Carroll sent out 11 total runners during the Gulfstream Park Championship meet, with her last start coming on March 1. Carroll is hoping some of her promising three-year-olds live up to their potential after three of her top graded stakes winning mares, Moonlit Promise, Ami’s Mesa, and Gamble’s Ghost, were all retired to the breeding shed following the Woodbine season. One of those promising three-year-olds is Queen’s Plate Winterbook favourite Avie’s Flatter, who is set to make his three-year-old debut in the Grade 3, $150,000 Transylvania Stakes on turf at Keeneland this coming Friday. Carroll had been working Avie’s Flatter over the dirt this winter in Florida and could have run him in a Kentucky Derby prep, but opted for the turf based on the way he trained over it. Avie’s Flatter won the Cup and Saucer Stakes on the turf last season and also finished fourth in the Grade 1 Summer Stakes. Despite not making a start on dirt this winter, Carroll is optimistic that Avie’s Flatter could excel over all three legs of the Canadian Triple Crown later this summer. “I like the fact that he’s shown me that he handles all three surfaces, which is exciting with the Canadian Triple Crown coming up,” she said. Another Queen’s Plate prospect Carroll had with her this winter is He’s a Macho Man, won his debut around two turns at Woodbine back in December and made a start over the dirt at Gulfstream Park in January. Carroll has missed some training time with He’s a Macho Man following his start at Gulfstream. Carroll also had Wonder Where Stakes winner Avie’s Mineshaft down in Florida this winter. Avie’s Mineshaft made one start at Gulfstream Park this winter, finishing seventh in the Grade 3 Suwannee River Stakes on turf on February 9. 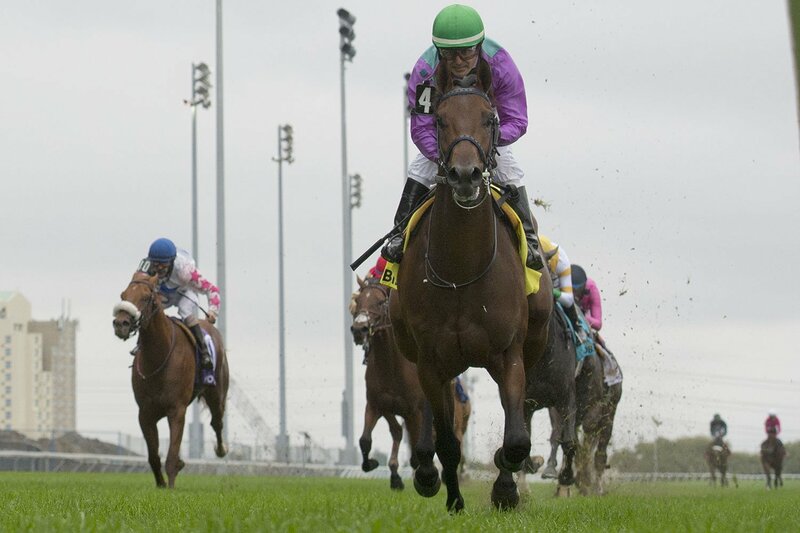 Carroll said Avie’s Mineshaft may run at Keeneland, but her long-term target is the Grade 2, $175,000 Dance Smartly Stakes at Woodbine as part of the Queen’s Plate undercard on June 29. While some horses that are part of the Florida string will be making a stop over at Keeneland, the remainder of Carroll’s stable is currently all moved into Woodbine. Carroll noted she had 30 horses at Woodbine already in preparation for the 2019 season, which kicks off with Opening Day on April 20. Three Woodbine trainers recorded wins last week, led by Mark Casse, who found the winner’s circle at both Oaklawn Park and Tampa Bay Downs. Casse recorded a stakes win with March to the Arch in the Turf Classic Stakes at Tampa Bay Downs on March 31 and also sent out Starinthemaking to victory at Oaklawn on March 29. Casse also recorded a runner-up finish from Eyeinthesky in the Sophomore Fillies Stakes at Tampa Bay Downs on March 31. Norm McKnight also recorded a pair of wins at Oaklawn Park last week, which included Whispering Speaker on March 28 and Pat Daddy on March 31. McKnight also recorded a runner-up finish from Cosmic Hallelujah on March 30 and a third-place finish from Spirit of Caledon on March 28. Nicholas Gonzalez recorded a win from Diddley at Gulfstream Park on March 29. Gonzalez’s other starter of week, Littleroughjustice, lost his rider and did not finish on March 31. Three Woodbine jockeys also made trips to the winner’s circle last week, led by Ademar Santos, who won four races at Tampa Bay Downs. Santos recorded wins aboard Bode Jack on March 27, Returnthestar and Faction Cat on March 29, and Sunshine Smiles on March 31. In all, Santos recorded four wins from 16 starts last week and also picked up three runner-up finishes from Chilling Secret (March 30), Isabellita (March 30) and Appealing Audrey (March 31), and two third-place finishes from Duke of Monroe (March 27) and Straight Madness (March 29). Luis Contreras recorded three wins from 14 starts at Sunland Park last week. Wins from Contreras included Valley of the Hide (March 26), Curlina Curlina (March 31) and Gold Slipper (Mar. 31). Contreras also recorded two runner-up finishes from J Serino (March 26) and Sidney’s Hope (March 30), and four third-place finishes from Trust Emily (March 26), Superbad Warning (March 30), Wadaboutdarest (March 31) and Selection Park (March 31). Rafael Hernandez recorded a victory with Even Beat at Gulfstream Park on March 29. In all, Hernandez recorded a win and a third-place finish from 12 starters last week. Gary Boulanger recorded one third-place finish from four starters at Tampa Bay Downs last week. Boulanger finished third aboard Skep during the March 29 card. Kirk Johnson had a pair of mounts last week at Aqueduct aboard Big Wonder (6th, March 29) and Colonel Canuck (DNF, March 30). Here’s a look at how the other Woodbine trainers fared last week, in alphabetical order, starting with Kevin Attard, who had a pair of runners in graded stakes at Gulfstream. Attard sent out Melmich to a runner-up finish in the Grade 2 Pan American Stakes on March 30, while A. A. Azula’s Arch finished a close fifth in the Grade 3 Orchid Stakes on March 29. Attard also sent out Mayan Ghost to an 11th-place finish at Gulfstream on March 30. Fafa Fooey finished fourth at Gulfstream Park on March 29 for Sid Attard. Tino Attard sent out Drink in My Hand to a runner-up finish at Gulfstream Park on March 28. Roger Attfield came within a head of recording a graded stakes win at Gulfstream Park last week, as Ickymasho finished second in the Grade 3 Orchid Stakes on March 29. Howdy Boy finished sixth at Penn National on March 28 for Steven Chircop. Gail Cox sent out Strike It Royal to a third-place finish at Gulfstream Park on March 28. Last Sunrise finished 13th at Gulfstream Park on March 30 for Catherine Day Phillips. Michael De Paulo recorded a pair of starters at Gulfstream Park last week, including Insider Trading, who was seventh in the Cutler Bay Stakes on March 30, and Theregoesjojo, who was sixth on March 31. Jacob’s Brew finished 10th at Laurel Park on March 29 for Justin Nixon. Pat Parente recorded an in-the-money finish at Gulfstream Park last week with Titochip, who finished second on March 29. Colonel Canuck was eased in his start at Aqueduct on March 30 for Gerald Seymour. John Simms recorded a runner-up finish from Chilling Secret at Tampa Bay Downs on March 30. James Smith sent out a pair of runners at Tampa Bay Downs last week, including Piccadilly Beau (11th, March 30) and Best Bard (9th, March 31). William Tharrenos recorded a pair of starts at Gulfstream Park last week, including Dexter Road (10th, March 30) and Black Sea (9th, March 30). This entry was posted in Woodbine News and tagged 2019 Queen's Plate, Ademar Santos, Ami's Mesa, Avie's Flatter, Avie's Mineshaft, Gamble's Ghost, He's a Macho Man, Horse Racing, Josie Carroll, Luis Contreras, Mark Casse, Moonlit Promise, Nicholas Gonzalez, Norm McKnight, Rafael Hernandez, The Queen's Plate, Woodbine. Bookmark the permalink.